Stunning and rare case map of Ireland. A Map of Ireland divided into Provinces and Counties shewing the Great and Cross Roads with distances of the principal Towns from Dublin. Also the Steam Communications from the Out Ports, and the average Time of Passage. 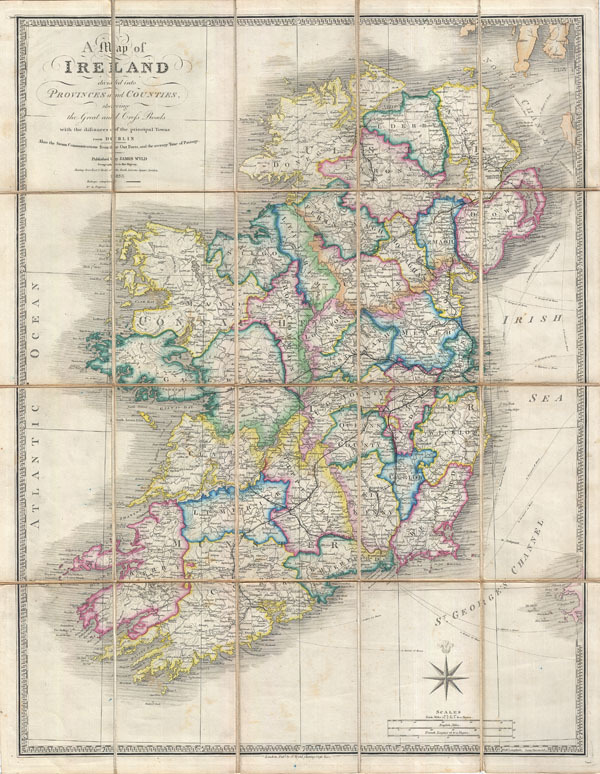 A stunning example of James Wyld's 1853 case map of Ireland. Covers the entirety of Ireland as well as the major nautical and ferry routes between Ireland, England and Scotland. Divided and color coded into provinces and counties. Offers extraordinary detail throughout, identifying all major towns, rail lines, post roads, rivers, canals, and some undersea formations. Cartographically this map is based upon William Faden's map of 1798, the plates for which Wyld acquired upon Faden's death in 1836. Wyld updated the original plate with new cartographic information and a more contemporary keyboard style border. This particular example was prepared as a pocket or case map, being dissected and mounted on linen for easy folding. Comes with original binder which suggests that the may must have been originally acquired by a library Perth, Australia before being deaccessioned and finding its way to us. Very good condition. Dissected and mounted onto linen in 20 sections. Original linen backing. Comes with original linen slipcase.